Back when the truly excretable Dances with Wolves hit our screens the world revived an old kid's schoolyard game of dubious ethnic sensitivity -- the 'What Is You Native American Indian Name?' question. Mine is Wrestles with Packaging. Anything from a new roll of toilet paper to a bubble-wrapped pair of scissors will have my blood pressure rising as I attempt to gain access to the packaged product. The modern world seems to want to deny me access to any of its earthly delights by wrapping them all in plastic. Plastic isn't just bad for the planet, it's bad for my stress levels. Medicine seems to be the worst offender. There's nothing to make a headache worse than having to open a pack of pills encased in extra-strength plastic. Even the 'earth-friendly' soap that we sometimes get is packed in plastic. We were once given a packet of organic biscuits that were individually wrapped in plastic. To top it off they tasted like something you would use in packaging. I'm not alone in my despair with modern packaging design. There are even products made especially to deal with blister-packs and over-wrapped items. 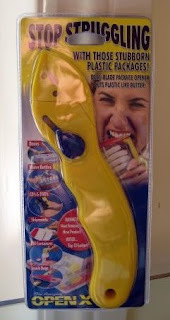 But, of course, these openers come in a blister-pack. Only light-bulbs, in their flimsy cardboard boxes, seem immune to the modern disease of over-packing. I know for a fact that your name is really "Dances with Butterflies"! I remember the dance vividly! Mine has always been "Runs With Scissors".. Wondered how to get a comment or two on this blog. Set a trap for Trills, whose Indian name may well be "Always Makes That Joke". Mwah ha ha! Evil triumphs again!